The International Federation of Robotics is an industry group. Each year, it publishes a World Robotics Report, and while you need to pay big money for the full report, the Executive Summary and some illustrative slides are freely available. Here are some snapshots of the global robotics industry, released in the last few weeks from the World Robotics Report 2017. For industrial robots, "There are five major markets representing 74% of the total sales volume in 2016: China, the Republic of Korea, Japan, the United States, and Germany. 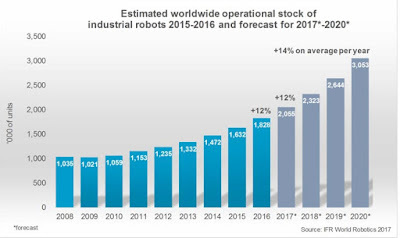 Since 2013 China has been the biggest robot market in the world with a continued dynamic growth." 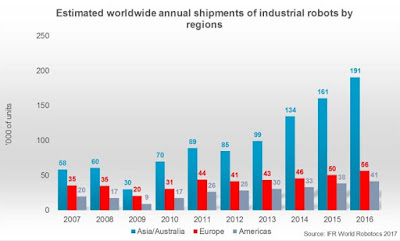 Here's the pattern of industrial robot sales in the last 10 years by region. When categorized by industry, most industrial robots are in the automotive or the electrical/electronics industries. The stock of robots refers to the total number in service, rather than the sales in a given year. 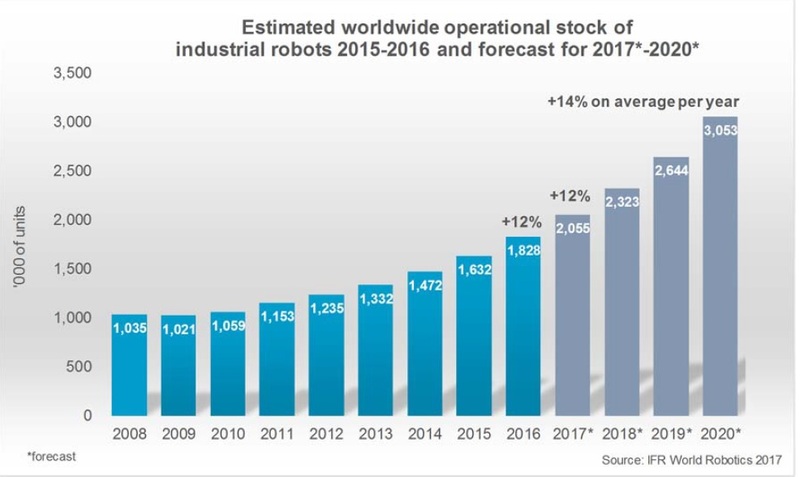 "The total worldwide stock of operational industrial robots at the end of 2016 increased by 12% to about 1.8 million units. Since 2010, the stock has been increasing considerably by 10% on average per year." automotive industry. ... Up to 2009 Japan had the highest robot density worldwide. But since 2010 the Republic of Korea and since 2015 Singapore have topped Japan in this respect. Japan’s robot density has been declining since 2009. In 2016, 303 robots were installed per 10,000 employees in the manufacturing industry. "The development of the robot density in China was the most dynamic one in the world due to the significant growth of robot installations in recent years. Particularly between 2013 and 2016, the rising rate of robot density accelerated in China, from 25 units to 68 units. 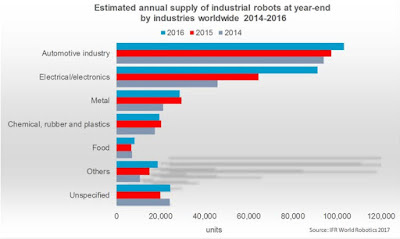 Due to the dynamic development of robot installations since 2010, the robot density in the United States increased significantly from 114 installed robots per 10,000 employees in the manufacturing industry in 2009 to 189 robots in 2016." The raw numbers seem to suggest that there is substantial potential for higher use of industrial robots in the United States, perhaps especially in industries not currently making much use of them. 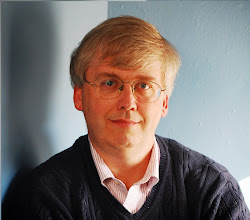 There is also a separate category, smaller but faster-growing, of "service robots." In professional applications, service robots are already having a significant impact in areas such as agriculture, surgery, logistics and underwater applications and are growing in economic importance. Driven by evolving security threats, there is a growing need to monitor everyday environments, which results in increased and difficult-to-manage workloads and data flows. To help meet this need, robots will play an even greater role in the maintenance, security and rescue market. Robotics in personal and domestic applications has experienced strong global growth with relatively few mass-market products: floor cleaning robots, robo-mowers and robots for edutainment. Future product visions point to domestic robots of higher sophistication, capability and value, such as assistive robots for supporting the elderly, for helping out with household chores and for entertainment." Robots are coming to the global economy. If you are someone who worries about slow productivity and wage stagnation, as I do, it's a trend to be embraced. Moreover, the US economy and political system has only very limited control over how fast the robots come. If robots aren't embraced here, it will in no way stop them from being embraced elsewhere around the world. New technology involves change, pretty much by definition, but over time, the best course of action is to figure out how to work with the change.